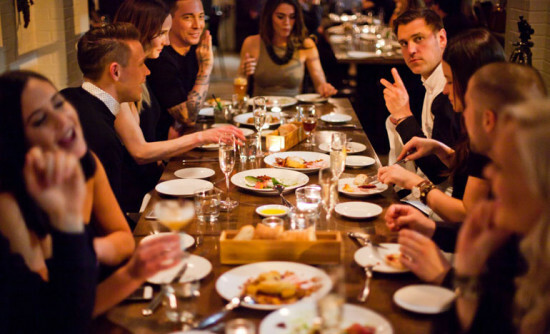 Vancouver, BC (February 14, 2017) – Yaletown’s Italian-inspired culinary gem, La Pentola will be celebrating “All things Piedmont” at its next Family Supper Series on February 19. Chef Travis McCord has created a special nine-course menu ($65pp) in homage to the historic Italian region, which is known for its rich flavours, bold red wines and indulgent desserts. Situated at the foot of the Alps, bordering France and Switzerland, the Piedmont region is known for its hearty mountain fare, and the first Family Supper Series of 2017 celebrates this with a feast to remember. Beginning with a sumptuous Duck Terrine, followed by marinated Tomini Cheese and pickled vegetables, Chef McCord’s menu is an exquisite toast to the fresh, seasonal ingredients of the Italian countryside. Guests are invited to explore the many flavours of Italy, from Gorgonzola and Potato Agnolotti blanketed in sage butter sauce, to Tajarin with Rabbit Ragu, before finishing the meal with delicate Petit Four. La Pentola’s Family Supper Series is hosted once a month and served ‘alla famiglia’ with sharing plates ideal for enjoying with friends and family. Each month features a new theme and deliciously diverse menu. Reservations can be made by phone at 604.642.0557 or by emailing info@lapentola.ca. La Pentola is open 7 days a week for Breakfast, Lunch, Dinner and Weekend Brunch (closed daily from 3pm-5pm).